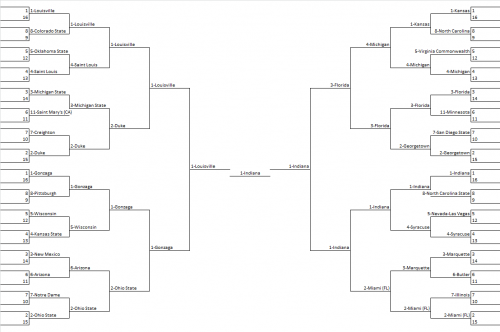 With the tournament under way, I wanted to post my NCAA Tournament predictions. Things didn’t go so well for me with my Conference Tournament predictions, so hopefully the big dance will provide some sort of redemption. I really hate the traditional bracket with normal scoring rules, as the best bracket ends up just being pretty much chalk and, well, what’s the fun in that? 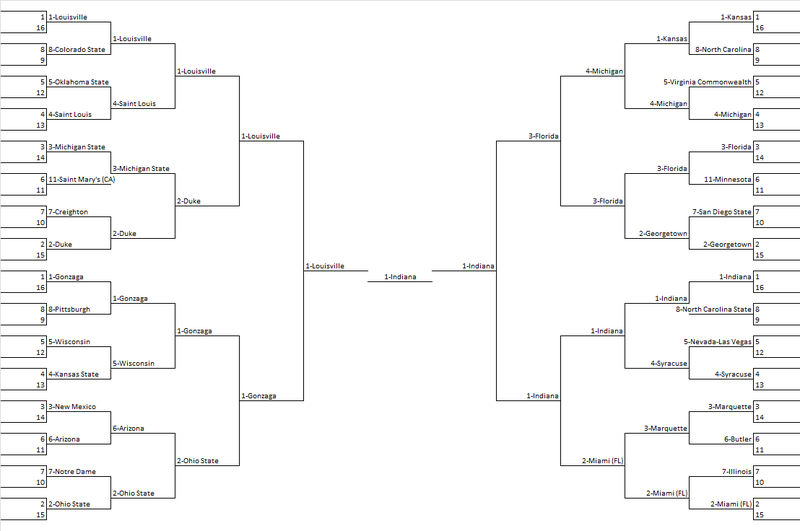 However, I’m guessing most people want to see my “bracket” so I’ll provide it. It’s really unexciting: only two double-digit seeds are favored by my system in the first round–11-seeds St. Mary’s and Minnesota–and there are only a couple more mild upsets along the way. There’s a lot of information in predictive systems like mine, but this bracket shows virtually none of it. A better way to display all of the information is with advancement odds, like I did for conference tournaments. Here is the likelihood of each team advancing to each round of the tournament. The table is fully searchable, sortable, and filterable. I added in the region and seed so you can sort and look at best/worst teams by seed and region. For now, it’s time to finally enjoy the games.